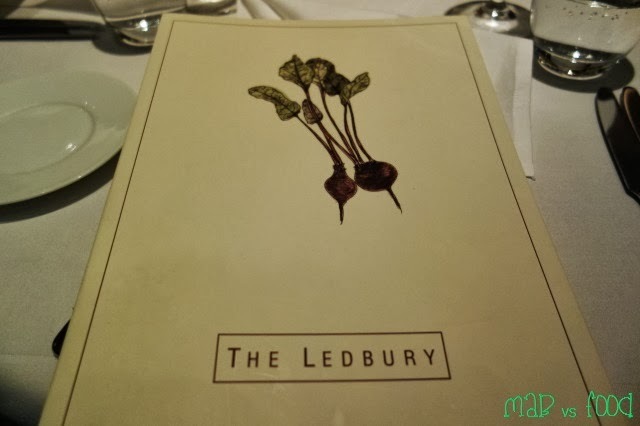 My first of many, many posts about my food highlights from my trip to Europe in October is my dinner on a cold Saturday night at The Ledbury in Notting Hill, London. The Ledbury is a highly acclaimed restaurant that has a long list of achievements, including 2-Michelin stars, 13th best restaurant in San Pellegrino’s World’s 50 Best Restaurant list, and best restaurant in the UK in the Restaurant Magazine's National Restaurant Awards for three years running (until being knocked down to second this year). The man behind The Ledbury is none other than Brett Graham, an Australian and a Novocastrian. On the back of winning the Josephine Pignolet award for young chef of the year, Brett Graham arrived in London 13 years ago to gain further experience. With intentions to only stay for a year in the UK initially, he is still in London 13 years later. And he seems to be going from strength to strength with The Ledbury gaining worldwide recognition and another of his establishments, The Harwood Arms, being awarded a Michelin star. The occasion on this night at The Ledbury was that my wife and I wanted to treat a close friend of ours (who from now on will be referred to as N) to a nice meal. N is not really a person who is into fine dining, quite the opposite actually as he has a love for KFC. But he was willing to give Ledbury a go as I assured him that he will have a fabulous time. It’s the least we could do after all these years of friendship. Both the bread and the butter were really quite amazing. 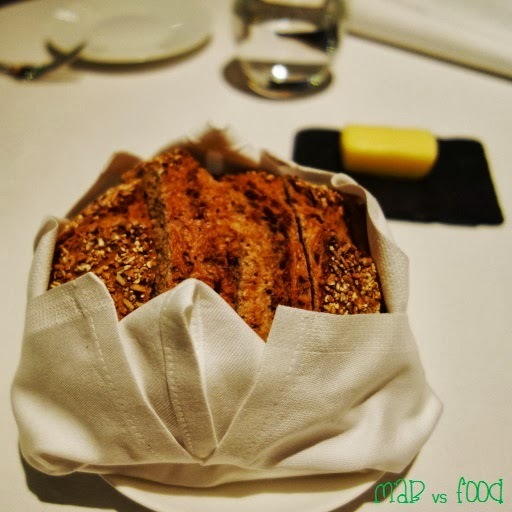 The bread had a great crust and as it was a multi grain bread, which gave it great flavour, it was heavier than most breads at other fine dining restaurants. Once N had learnt that restaurants in Europe do not stop refilling your bread (and at no extra cost), there was no stopping him from asking for more bread throughout the night to mop up every plate clean. Both my wife and I started doing this. Good job N, you are learning quickly! 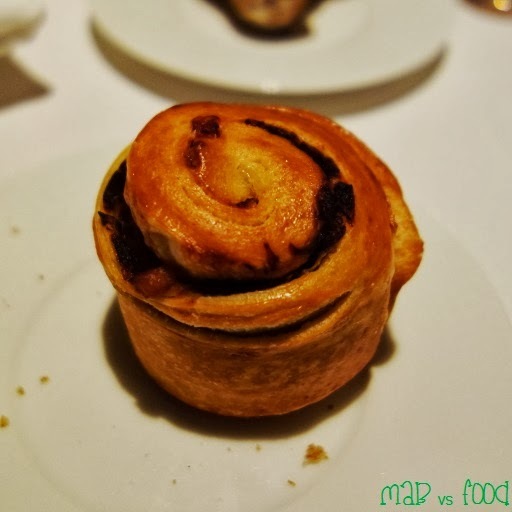 We were also given a choice of a bacon scroll and a malt bread roll. I went for the bacon scroll, which was just so flakey and so tasty that I wanted seconds, and N and my wife had the malt bread roll as they both can’t eat pork. These little bite sized treats were just yum and whetted our appetites. Smooth, moreish gruyere cheese in a thin, crisp tart. These were gone in one bite so we were eagerly awaiting the first course. The ceviche of scallops were the first course for both myself and N. This course was perfect to start off the tasting menu and ticks all the boxes for what a first course should do. The scallops were thinly sliced and a lovely sweet, delicate flavour and soft, velvety texture. Then you get the crunch and freshness of those round discs of turnips. The frozen horseradish was quite refreshing and adds a slight pungency to the dish. I found the seaweed oil to be a very interesting ingredient, almost reminding the diner where there scallops came from, i.e. the sea. 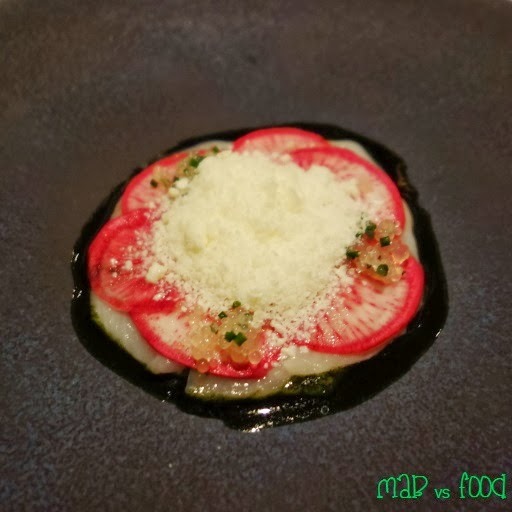 As my wife is a vegetarian, she had the dish with radishes instead of scallops. She also enjoyed this as a first course and particularly liked the seaweed oil. 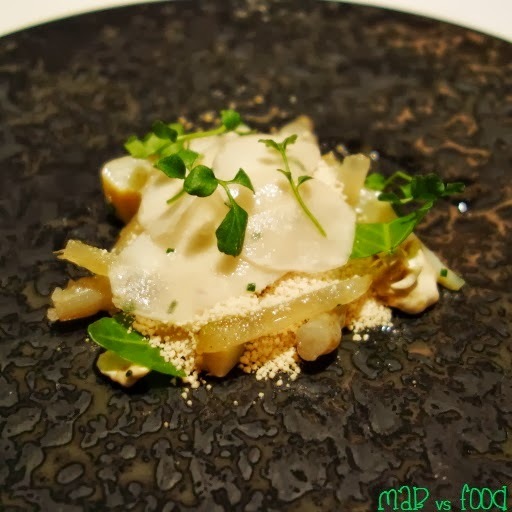 This salad of artichokes, walnuts, foie gras and pear was my second course. 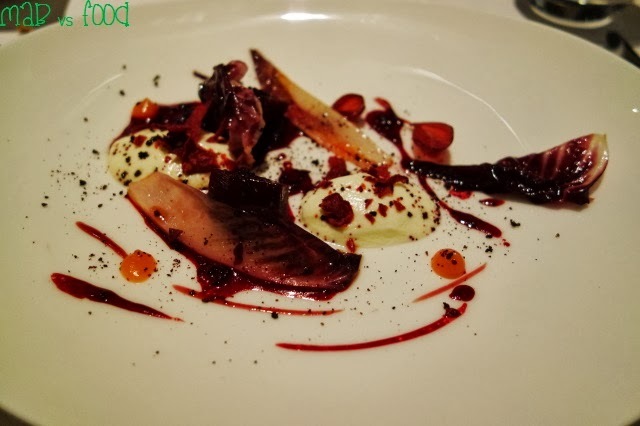 It was a very clever dish as it is able to successfully utilise a rather rich and heavy ingredient in foie gras and turning it into something that is really quite clean and refreshing. I enjoyed all the different artichokes used here and the crispness they had and the freshness they bring to the dish. 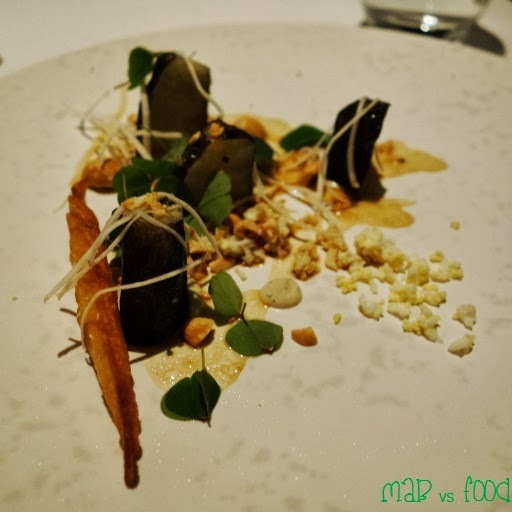 The contrasting flavours from the bitterness of the walnuts, the sweet, juicy pears and the rich savoury flavours from the foie gras is really a stroke of genius on Brett Graham’s behalf. The foie gras was grated into fine grains and was icy so it just evaporated in the mouth. So all in all, quite a spectacular dish. Both N and my wife had this dish as their second course. This dish is all about that aged Comte cheese, a semi hard French cow’s milk cheese, with all the other elements there to showcase and accentuate the pungent flavours of the Comte. My wife made the observation that she had not ever seen a cheese based course presented in this way: a creamy, slightly stretchy cheese served in an onion broth, which actually worked well with the cheese with its sweet and clean flavours. The flame grilled mackerel course that N and I had is a signature dish at The Ledbury and it is not very hard to see why. This dish was a whole new level of amazeballs, I really don’t know how to say how amazing this dish is in an eloquent way. I have never had such a good piece of cooked mackerel. I am a little sceptical of cooked mackerel at times as it is a flakey fish that can get a bit dry. But no such thing here. The mackerel was moist and flakey at the same time and that smokiness from the flame grill really takes the flavour of this dish to another level. The pickled cucumber really work well here and add some freshness and acidity to a dish that has a lot of big savoury flavours. And inside what looks like a rice paper roll are raw pieces of mackerel and avocado, a nice, clean way of enjoying mackerel to contrast the flame grilled version. This was probably my favourite course of the evening! My wife’s vego course was a highly enjoyable version of the tried and tested combination of sweet beetroots and creamy and salty goat’s cheese. The beetroot had an intense sweet and earthy flavour that we suspect was achieved through baking the vegetable in a salt crust. There were also some interesting fruity and acidic elements added here with plums and raspberries. These all work wonderfully with the beetroot and goat’s cheese. 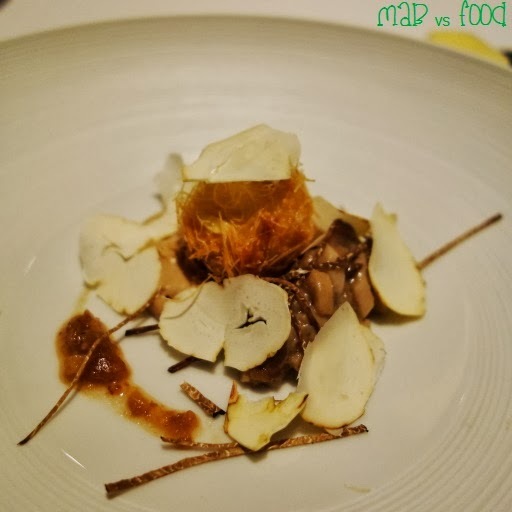 We all had the crispy quail egg course so we all enjoyed this course together. There was silence at the table. You could hear the sound of a pin drop, or is that the sound of crispy quail eggs being consumed? This dish was so good that it took the words completely out of our mouths, so we just stared at each other and had one of those ‘foodgasm’ moments (think Matt Preston on MasterChef when he eats something amazing). The flavours and textures in this course were spot on. A runny egg yolk combined with the pungent aroma and flavour of truffle (in this case from the strips of Wiltshire truffle and that creamy truffle emulsion) is one of my all-time favourite combinations. It is just so richly satisfying and delicious. The crispiness of the quail egg really does work a treat with all those rich, creamy elements. And to top it all off, you get the thin slithers of slightly sweet chestnuts and some lovely cepe mushrooms. I don’t know what else to say, except… just amazing! Both N and I had the sea bass course. The roasted sea bass was cooked to perfection. The flesh was moist and delicate. And the skin nice and crispy. 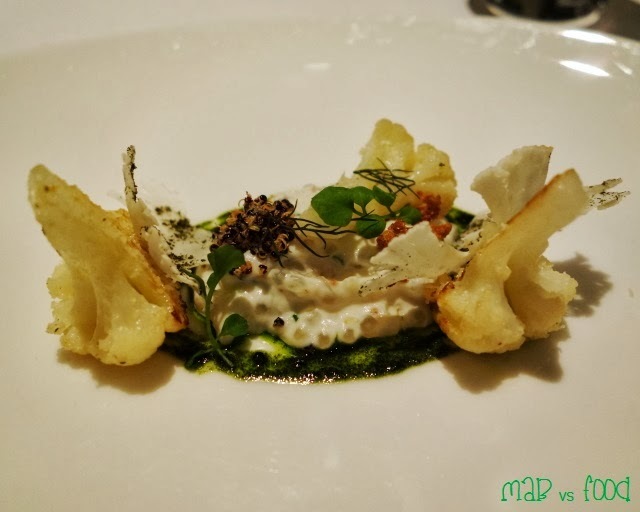 The sea bass was paired with a creamy cauliflower puree, tapioca, which I found interesting, and some crispy toasted quinoa. Even the cauliflower were amazing – great smokey flavour from the caramelisation process and had some bite (i.e. not soft as much and not too hard). Simply put, this was awesomeness on a plate! My wife’s vegetarian version obviously had the sea bass removed, so it looked like a risotto. My wife is not a fan of cauliflower at the best of times, and judging by the fact that she devoured them before I could even ask her what she thought, it was cooked to her satisfaction. In fact she said that if everyone cooked cauliflowers like that, she would be converted. Baked vegetables in a salt crust is my favourite way of having vegetables. There is something about the cooking process which enhances the flavour of the vegetables and gives the vegetables the perfect texture. The root vegetables in this dish included carrot, purple carrot, and beetroot. The juices from the vegetables and mixed with a bit of hazelnut oil at the base of the plate are divine, stuff that you want to lick off the plate or mop up with a bit of bread. 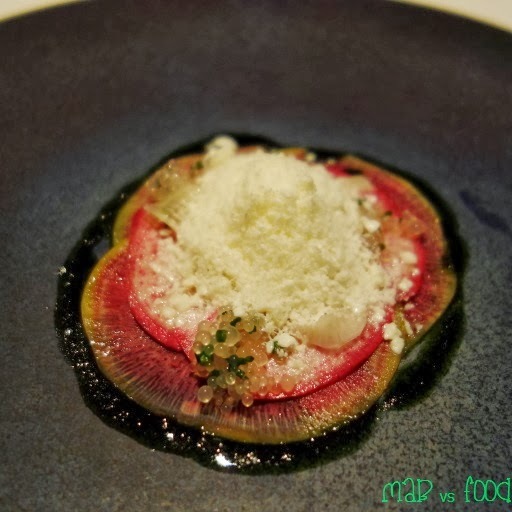 The root vegetables were bound together by a thin sheet of lardo di Colonnata (cured lard from Tuscany). 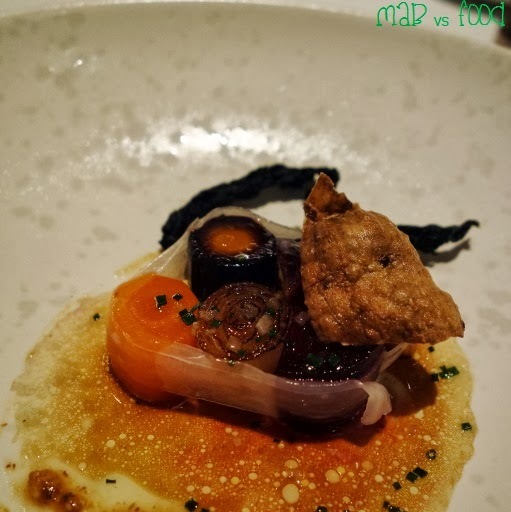 The salty and porky flavour from the lardo really does bring out the sweetness and the flavour of the root vegetables, a perfect match really. There was also a crunchy strip of black cabbage, an artichoke chip and some pork scratchings to give the dish some crispy textural elements. So overall, an excellent course show casing vegetables – a winner in my eyes. In place of lardo and pork scratching, my wife and N were served walnuts and pear. In essence, it was the same dish as mine. 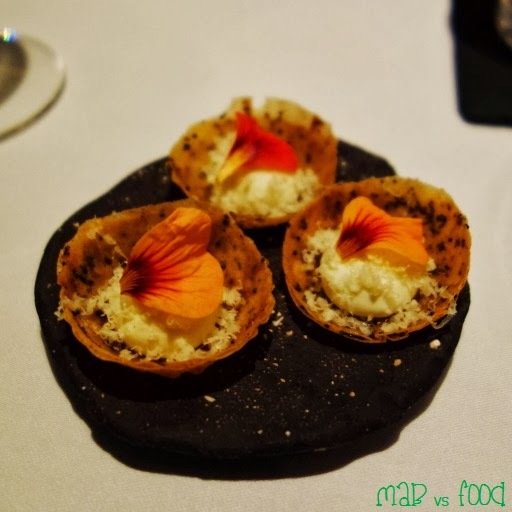 The speciality at Ledbury is game meats and with this final savoury course I could see why. 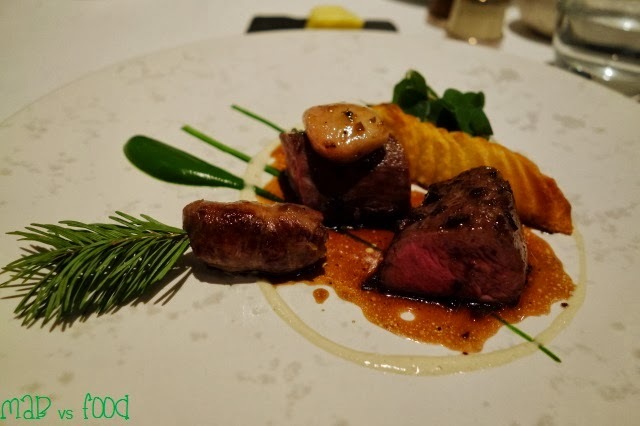 The fillet of fallow deer absolutely blew my mind away. This along with the flame grilled mackerel were my favourite dishes of the night. The deer was cooked medium-rare and had a nice reddish-pink centre. The meat was so juicy, tasty and oh so tender, almost like poking into a sponge. I didn’t find the flavour to be too gamey at all. The caramelisation on the fillet and the meaty juices on the plate were just amazing. The icing on the cake was the small blob of warm bone marrow sitting on top of the deer. It was soft, fatty and smokey and works so well with a nice hunk of meat. Also on the plate was a sausage made from deer meat, which was wonderfully spiced and had brilliant flavours, and thinly sliced crisp potatoes cutely lined up in a row. 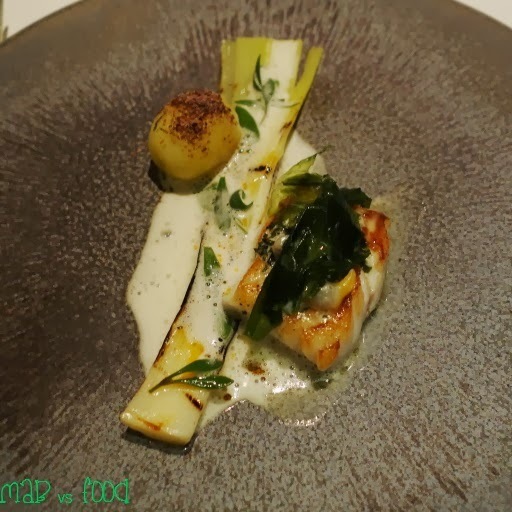 Served on the side was a celeriac puree and an emulsion of juniper, truffle, sherry and spinach. From the first bite, N was raving about this dish. 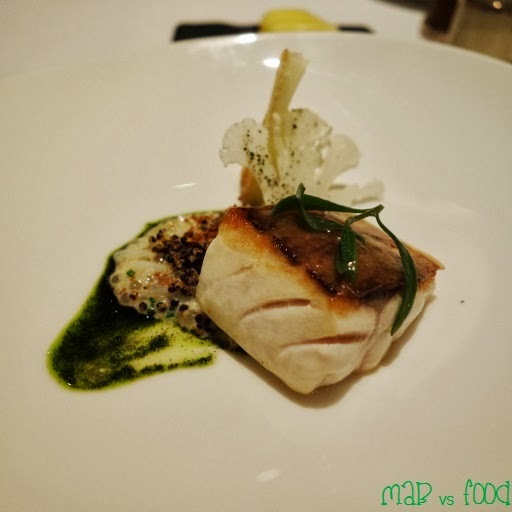 We had 2 other amazing fish courses this meal, but he reckoned the turbot was the best. I tried a little bit of this dish, but I beg to differ as nothing could touch that flame grilled mackerel in my eyes. The turbot was cooked to perfection I must admit: the flesh was soft and delicate in flavour and the creamy white wine sauce was superb. 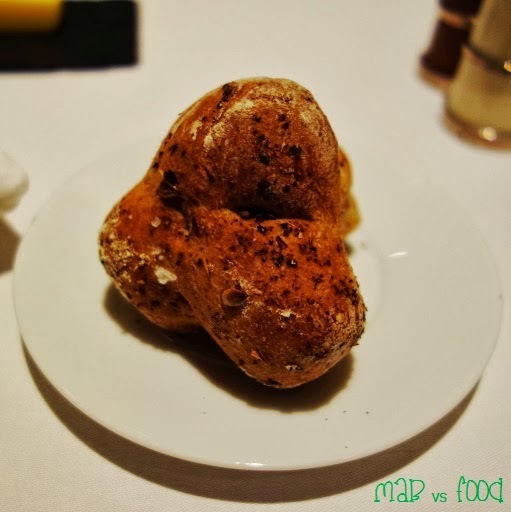 My wife’s vegetarian course was this interesting dish of salt baked celeriac coated with the ash of juniper berries. Celeriac is quite mildly flavoured on their own, but the with the distinctive flavour of juniper and accompaniments of chanterelle mushrooms, hazelnuts, scrambled eggs (yes scrambled eggs, according to my wife) and sherry, Ledbury takes the simple celeriac to another level. The flavour of juniper is hard to describe, except to say it tastes piney (think of gin as juniper berries are the main ingredient that gives gin its unique flavour). The same crisp potatoes in my deer course were also served in this dish. We decide to share one serving of cheese (extra 10 pounds) amongst the three of us, which I think was more than enough. I am not much of a cheese person, so I let our guest do the honours in choosing which five cheese to sample from the cheese trolley. N is quite the cheese connoisseur, as he has been refining his cheese palate during his weekly rounds at Borough Market on Saturdays, sampling all the cheese at the different stalls. Definitely one of the perks with living within walking distance of one of the best food markets in the world - I am definitely jealous! 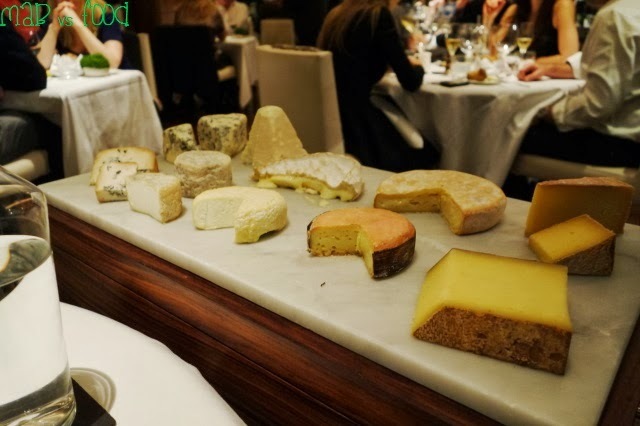 The cheeses we decided to go with were a blue cheese, which I run many miles from; a goat’s cheese; a Chaource, a cheese similar to camembert; an 18 month Gruyere, my favourite out of the cheeses we tried; and a hard cheese, which even I found mild. 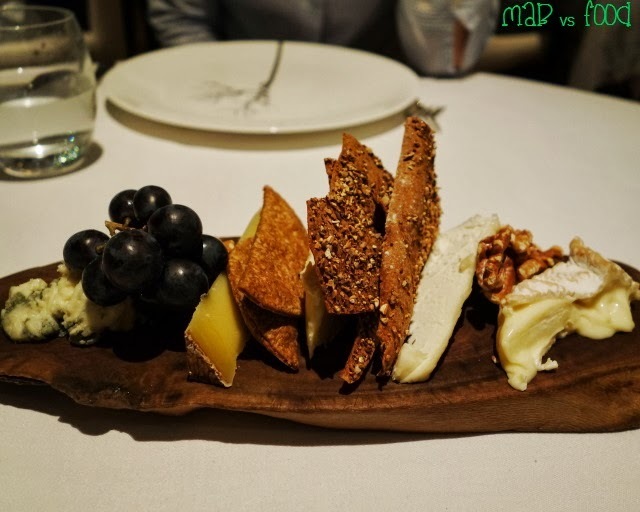 The cheeses were served with a selection of crackers, grapes and walnuts. For pre-dessert we had this deliciously, refreshing treat. 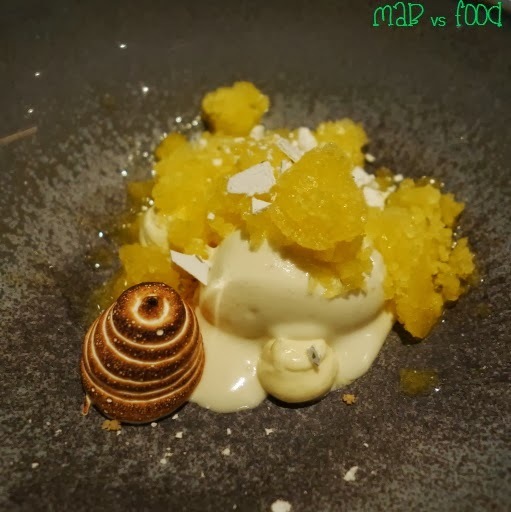 The combination of citrus flavours from the sharp lemon curd, tangy mandarin granita and the lemon verbena ice cream were really quite amazing. An excellent pre-dessert and palate cleanser that left the table salivating for the final course. When I saw the banana and chocolate malt tartlet on the menu, my eyes immediately lit up. For some reason fine dining restaurants tend to stay clear of bananas in dessert. Perhaps banana is not a particularly graceful ingredient. The last time I had banana in a fine dining restaurant was at the now defunct Becasse, where I had an amazing banana creme brulee. In any case, this dessert was just divine and an excellent course to finish what has been an amazing tasting menu. 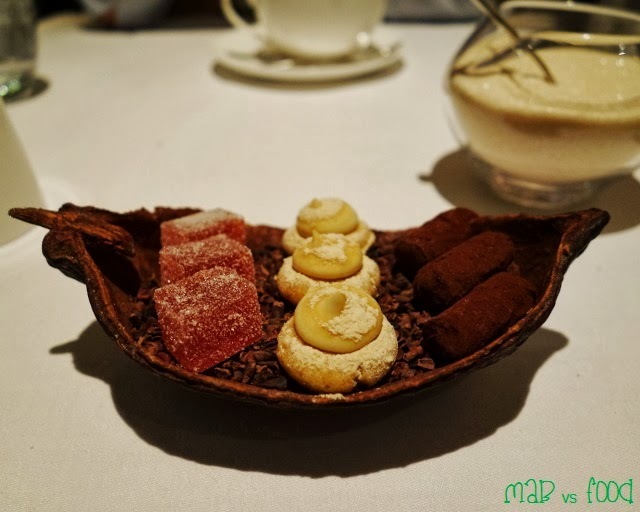 Everyone knows that the combination of chocolate and banana works a treat (just have a Nutella and banana crepe in Paris and you will see), and this dessert was no different. The chocolate was rich, smooth, gooey and to die for. Hidden inside the chocolate was a liquidy banana centre with small chunks of bananas. 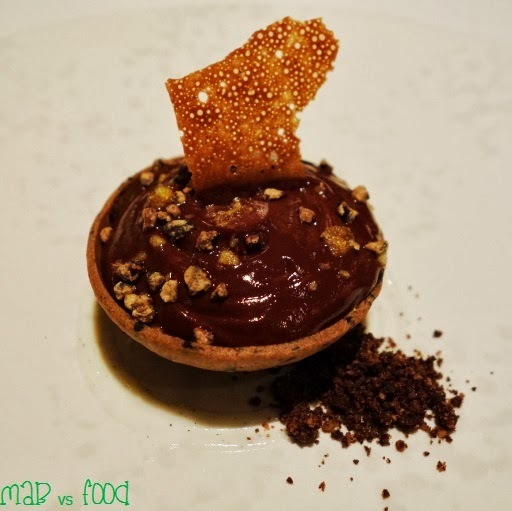 There was also some great contrasting textural elements in the dessert from the thin, crispy tart pastry, the thin caramelised tuile, hazelnuts and chocolate dirt. Overall, this was an excellent dessert utilising familiar yet delectable flavour combinations executed in a classy manner. Wow what a meal! 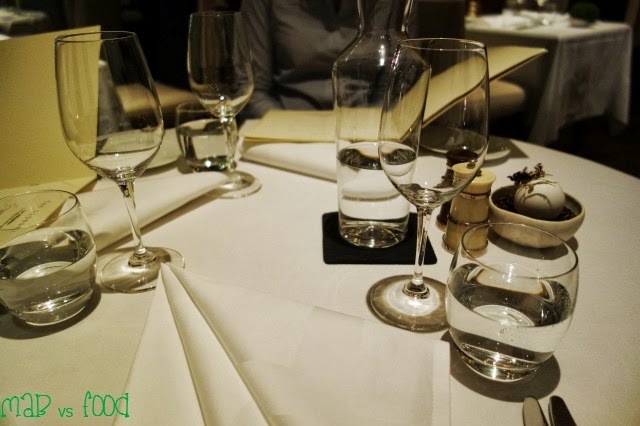 Everything was practically perfect at The Ledbury. It goes without saying that the food was delicious. 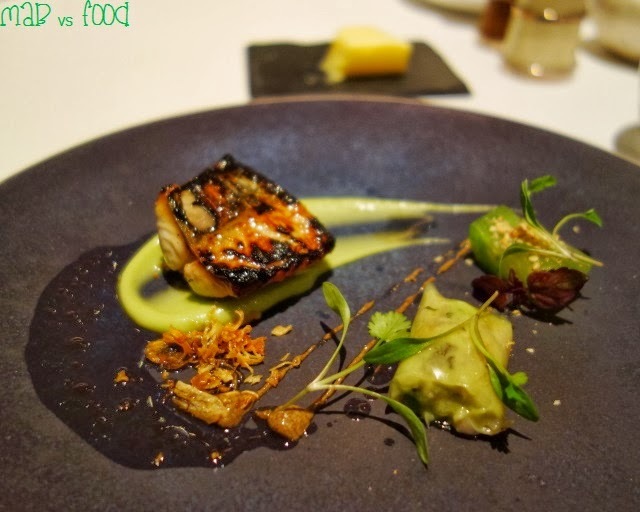 The tasting menu is very well constructed, with an excellent progression of courses from start to finish (we later found out that Ledbury had only just rotated to a new menu on the night). Sharing great food with amazing company is of course the best thing about eating out. N called this meal “easily the best meal of his life”; this made the meal all the more special for me. And as we were leaving the restaurant, my wife mentioned to the maitre d’ that we were from Sydney and enquired whether Brett Graham was in the kitchen tonight. The maitre d’ said he was and then offered to take us down to the kitchen to meet Brett. Wowsers, I certainly was not expecting that! I never ask to see the kitchen at any restaurant or the chefs, since being a quiet person, I just don’t know what to say to them or get in their way! I had nothing to worry about really, Brett was really friendly and easy to have a conversation with. Once you speak to him, you quickly realise what Ledbury is all about and what makes him tick. He is dedicated to and passionate about his restaurant (he calls Ledbury his baby), and what he cares about the most is making sure that his customers are happy. He is so devoted to the Ledbury that he spends most of his time in The Ledbury kitchen putting in the hard yards with his staff. 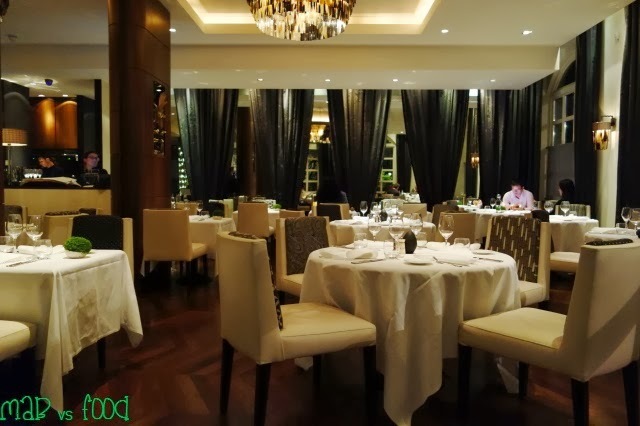 I also wanted to tell him that my wife and I had just travelled around Europe eating at a few 3-Michelin star restaurants and we would rate our meal at The Ledbury alongside, if not better than some of those meals. Brett Graham has a restaurant that he should be extremely proud of, leaving customers, like myself, raving to others just how amazing Ledbury is. But I did not get a chance to, as the kitchen was clearly still quite hectic and we were probably getting in their way, so we quickly got a picture with the man, and were off on our merry way, hoping that, one day, we will be back at The Ledbury. 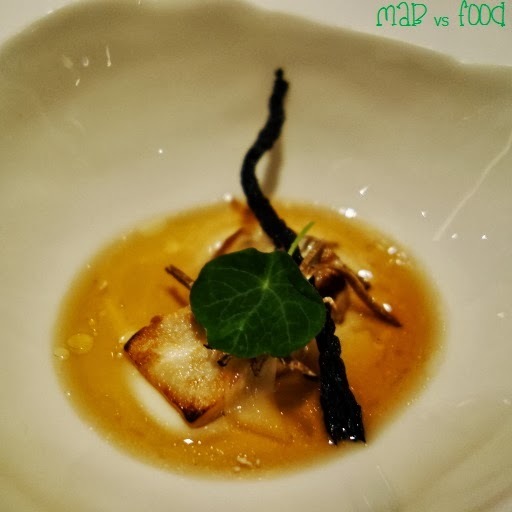 Highlight: It is hard to separate the flame grilled mackerel and the fillet of fallow deer, as both were top-notch dishes at a Michelin starred establishment. Also, getting to meet and talk to the man behind The Ledbury, Brett Graham, was a high. 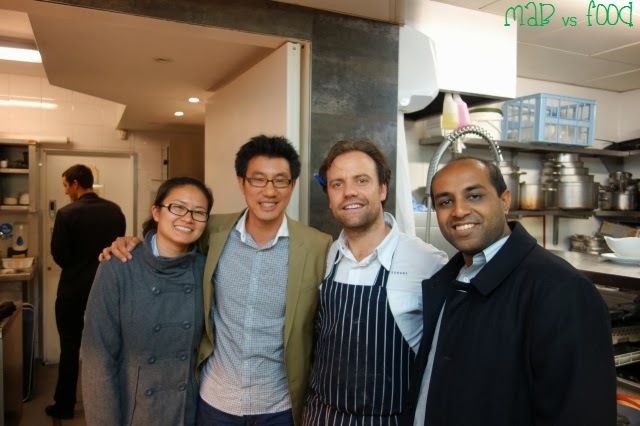 Lowlight: We Australians have lost such a talented chef in Brett Graham to the UK. Plus he has married an English girl not too long ago, so he won't be coming back to Australia anytime soon. Good news for London, bad news for Australia.